Blogging is great, both for students and educators. Welcome to our fifth and final week of New Teacher Boot Camp! Today we're going to be exploring blogging. Not only for students, but for educators as well. A blog (a blend of the term "web log") is a type of website or part of a website. Blogs are maintained by an individual, in our case a teacher or student, who writes a post, or regular entry, sharing a commentary, description of an event, or other audio-visual material such as a video. Entries are commonly displayed in reverse-chronological order. Most blogs are interactive, allowing visitors to leave comments on the blog and it is this interactivity that frequently distinguishes them from other static websites. Blog sites can combine text, images, and links to other blogs. They can also provide web pages and media related to the topic being shared. There are many blogging platforms such as Wordpress, Blogger and Edublogs to name a few, that are amazing for teachers to use professionally and with students. Greta is an ESL teacher in Buenos Aires, Argentina. Join me in reading her approach to using blogging in the classroom. Here is a short interview I did with her about her approach to using blogs in the classroom with students. Blogging is a wonderful way to motivate our students to write. 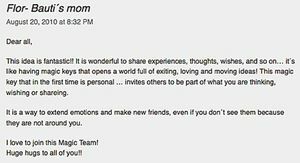 Students can share their stories, thoughts and reflections on their blogs. Writing for a real and global audience makes blogging an engaging and meaningful experience. 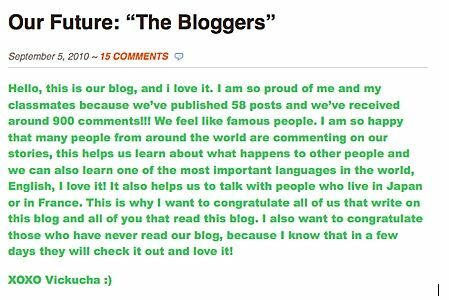 Blogging has made a difference for my students. Their writing and reading skills have improved significantly. Additionally, blogging has also inspired them to learn and explore about other web tools and technology. Thanks to blogging, many of my students have been able to find their voices and gain self-confidence. 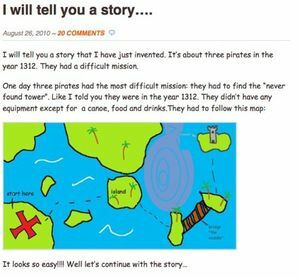 Below is an example of a student who wrote this adventure story, drew the image map and figured out how to embed it herself. You can read the whole story here. Next we have a an example of a student sharing his thoughts on blogging. 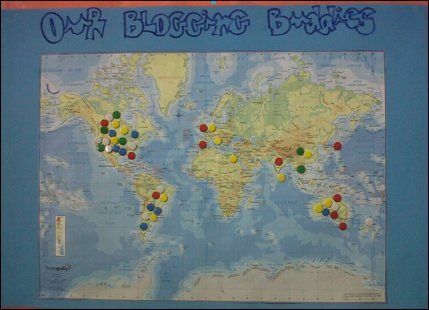 Blogging is also a fantastic way to bring parents and our entire school community into our classrooms. Students can blog about special events and share important news. Kids can even add videos and publish their own work. 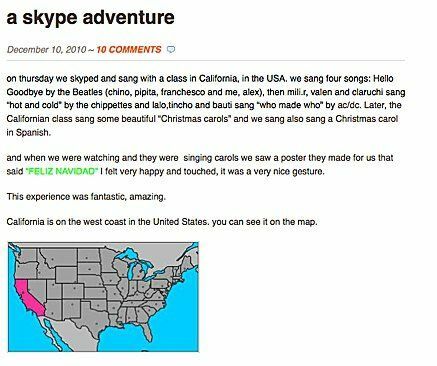 Next is a post by a student who wrote about a Skype call experience. 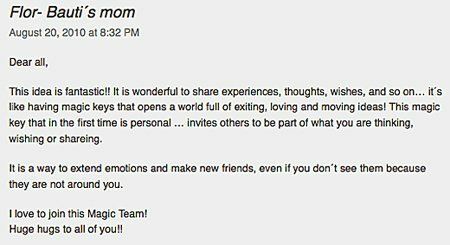 Below is an inspiring comment left by a parent sharing her thoughts about our blog. 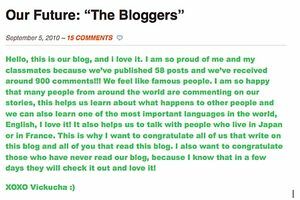 Commenting and reading other blogs will empower our students to build meaningful connections with people from all over the world. These connections will help them develop better critical thinking skills, as well as raise their global awareness. Students can take part in blogging challenges and global projects. Moreover, kids can collaborate with other classrooms through their blogs. Getting comments is important, but it's also beneficial to get our students to read other blogs and comment on them too. Comments4kids is an excellent resource to find other student blogs and get more comments on your students' work. Below is our blogging buddies map. It has been an incredible opportunity to learn about other countries and cultures. We marked every place we got comments from. Set up a personal blogging account. Follow all the account set-up steps. Explore your blog platform that you've chosen to see how it works. Write your first blog post! It doesn't have to be long...even a few sentences is fine. Save it and, if you are comfortable with this, post a link to it on Twitter! 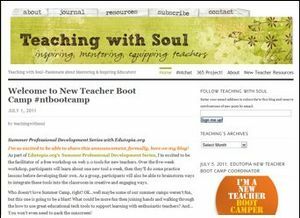 Use the hashtag #ntbootcamp when you post to Twitter so that others can see it and visit your blog to comment! Begin to reflect on how you will use blogging yourself, and with your students. Once you've created your blog post capture a pic of it with a tool like Jing. Click on it to embed the pic on your wiki page. Click Save again and a photo of your blog should now appear on your page! Thanks so much to Greta for the great idea of how a new teacher could begin to explore using blogs in the classroom! Sharing Good News Greta Sandler's student blogs (2010). (Select "Any Time" from the second Recent Posts drop-down.